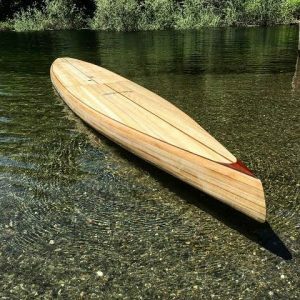 The 17′ Unlimited length SUP board by Clearwood is now ready for production after a year of designing, building and testing. 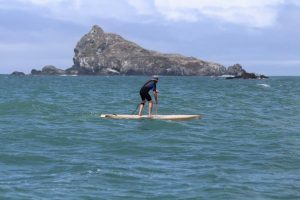 We’ve been paddling the board in a wide range of conditions varying from glassy flatwater to wind chop, and in both upwind and offwind conditions. I also raced the board in terrible, rough ocean conditions and still had fun, but had the most fun in more protected water. 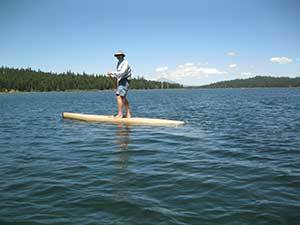 The Unlimited 17′ x 27 1/2″ stand up paddleboard went upwind well in 10-12kts of wind and was really swift off the wind. This is definitely not a “downwind” board in the sense of doing “downwinders”, but more a fast cruiser which will be suitable for paddlers up to 260 pounds handling a wide range of conditions. Conceptually, the development of this board has been to accommodate bigger paddlers that still want a board that performs well. The Clearwood Paddleboards 17′ Unlimited length SUP board will be a great board for extended touring with the ability to handle sizable loads or will be perfect for the larger paddlers out there that just want a great board under them. The 17′ Unlimited length SUP is based on the very successful and swift “Cascade” lineup of boards. We’ve added length, and reconfigured the rocker line and think we’ve created a fun and fast platform for paddlers wanting to paddle a longer board. The board is designed with the same reliable “fishbone” style frame with a few added structural elements to give the board a very solid and stiff feel. The prototype board came in at a very respectable 42 pounds using paulownia strips with salvaged redwood pin line and features. I’m really looking forward to paddling this board with a gps on board so I can see what kind of speeds we’re getting with the prototype. But I can tell after paddling the board that it sure seems like I’m going fast! I’ve been paddling my set of Black Project standup paddleboard fins on my 12′ 6″ and 14′ flatwater hollow wood paddleboards for a couple of months now and have a pretty solid feel for the performance value this set of fins contributes to my paddling. These are highly refined fins that address all the components necessary to provide uncompromising performance for those wanting to get the most out of their paddling whether racing or touring. The super refined foil on these fins is based on the extensive experience of Black Project founder, Chris Freeman and his team riders who has been involved with windsurfing and paddleboarding for many years and have developed Black Project fins based on the need for speed and performance. In my opinion, these fins leave nothing “on the table” when it comes to maximal performance. The primary reason I have been attracted to Black Project fins has been to really get the most out of my hollow wood standup paddleboards and also, since I’m usually one of the more senior paddlers on the course I need all the help I can muster! What I have found over the course of dozens of sessions is that the ease with which I can maintain my target strokes per side has improved and my strokes per mile have gone down by a few percentage points on average. I find these fins to just feel smoother through the water with less visible tail turbulence than any fin I have previously used. For crosswind/side chop conditions the R8 Series in the 28 size has provided a combination of speed, stability and control that is really easy to feel and provides major confidence in rough conditions. All in all, these are great fins for touring or racing if you are looking for a seriously uncompromising fin. I have been thinking about fin set ups for my flat water boards lately…..maybe that’s because I left the last decent fin I had sitting on the tailgate of my truck when I drove away at the end of a session recently. The result is that I lost the fin and have been using a recycled longboard fin for some time now, thinking that I would get a new selection of fins to try out when I had a new board to put them on. Well, with the exception of the lousy cold weather we have been having, I’m almost ready to glass a new 12-6 and figure the derelict beater fins I have been using need a bit of an upgrade for the new board. A race I competed in this past summer also got me thinking about getting set up with a quiver of fins. I had the unfortunate experience of losing a race because I did not have a weed fin. I don’t get the chance to win many races in that I’m usually the oldest or nearly oldest racer on the water, so losing a race because of being too cheap to have a weed fin really did not feel too good….and especially since on two occasions in that particular race I bailed off the board in a darn cold Puget Sound to clear the weeds…. and STILL had to settle for second! 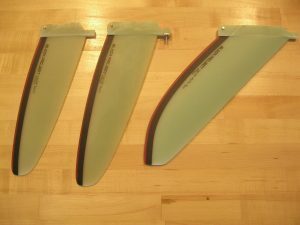 The fins are on the way from Hawaii right now and I should have them by the time this blog post is up and live and I’ll be offering up feedback on the performance of the new fins soon. What I already know about Black Project Fins is that they have been getting some great reviews from some really experienced paddlers I know so I don’t think I’ll be disappointed! What should the choice be for an all around fin if you don’t want to invest in a quiver? I think the main question that a paddler must ask is about the conditions you will typically be paddling in. One of the reasons I decided to invest in a quiver is that I paddle in a lot of different conditions and types of water from beautiful clear Eastern Oregon high mountain lakes to marine estuaries full of stealthy sea grass just waiting for a fin to come along and hang up on! If you paddle estuaries that are prone to being clogged with sea grass then a weed fin may be the best choice. If you paddle in wind and chop , you might want a slightly bigger fin than if you mostly paddle morning glass conditions. If you paddle different types of water and conditions and spend some amount of time in grassy water, then a weed fin may be the best choice. You, the paddler need to assess the type of water you paddle and decide how you want to set yourself up when it comes to fin selection. I paddled my first down winder the other day and what an eye opener that was! I did ok for a first attempt but using my flatwater board for a down wind run was WORK! 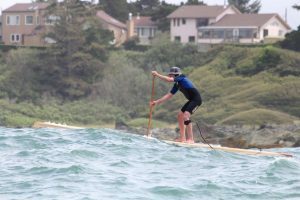 Not that a proper downwind board wouldn’t have been work but with limited nose rocker in my flatwater board I had to be really quick in stepping back to the tail in order to keep the nose from pearling. Most of my efforts were successful. The efforts that were not were, well, humbling. I consider myself a decent paddler and surfer both, but dealing with the short period chop left little time to get things sorted and organized for the next little wave train I wanted to go for so I found myself paddling “catch up” a lot and being slightly behind the curve. So I learned a lot, had fun and now know what the right board should be and have a design started for the next racing season.